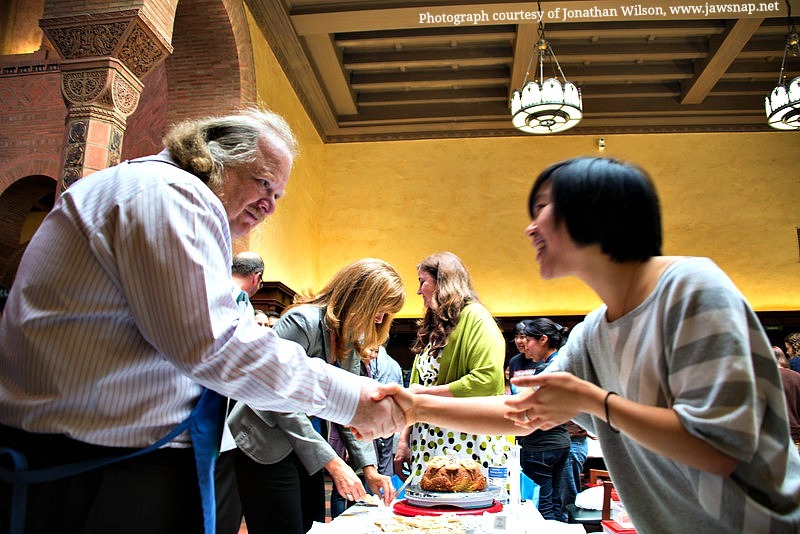 Last week I shared with you the enormously successful Edible Books Festival that our library hosts every year around the beginning of April. 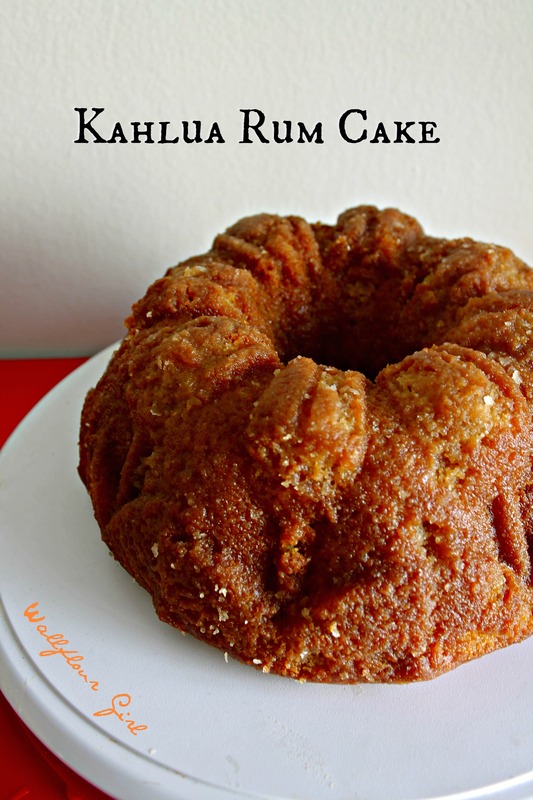 Well, today I’m sharing two award-winning recipes: Soaked coconut poke cake, and Kahlua rum cake! 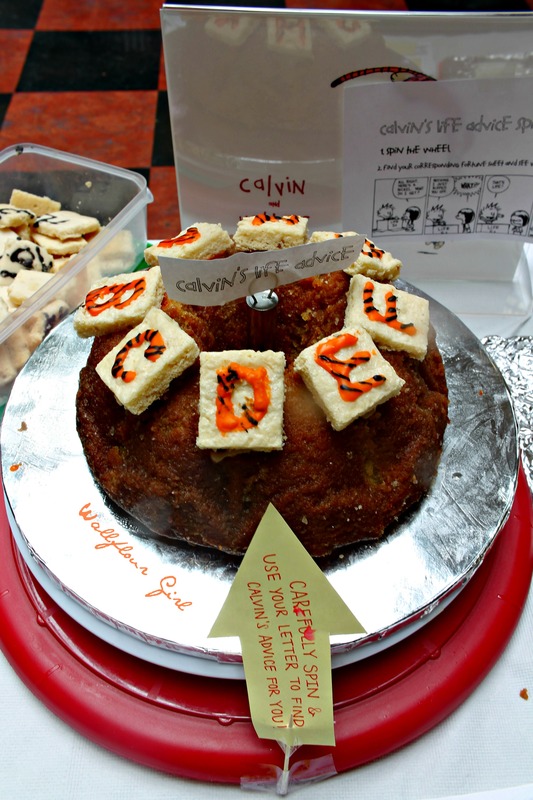 I am unapolegetically posting these photos of my Calvin & Hobbes-inspired entries–after spending basically 50 hours planning & executing my interactive cakes/cookies/displays, my hands were so unsteady that I could barely hold my DSLR straight! Photograph: And an encore of this cake, which was my favorite conceptual design of the entire entry. It’s Calvin’s life advice wheel! Each letter corresponded to a different lettered card with a piece of awesome advice from Calvin. Randomly pick a letter from the wheel and find out what Calvin has to say to you with the Calvin and Hobbes Life Advice Cards I created! 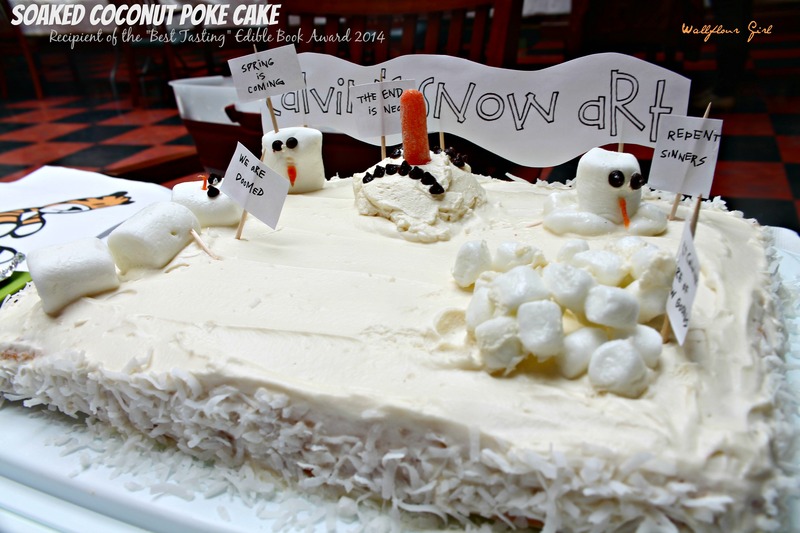 What is a poke cake? Fantastic question. At the event I kept channeling my inner Hawaiian and calling it ‘poke-key’ cake. It’s actually supposed to be poke cake, as in the thankfully-outdated, “You have just been poked by [that extremely awkward acquaintance to whom you have not spoken in at least 5 years] on Facebook…” Awkward. The idea behind a poke cake is just that: you poke a lot of holes into it. Then you basically drench it in a bunch of liquid (here, I used cream of coconut, milk, and a few other ingredients) that will soak through the poked holes and seep into every pore as you seal it all up with some whipped milk buttercream frosting. Yum. The best thing about this cake is that it’s the moistest cake imaginable, fluffy, packed with coconutty flavor without being overly sweet, and an absolute surprise when you sink your teeth in for your first bite. 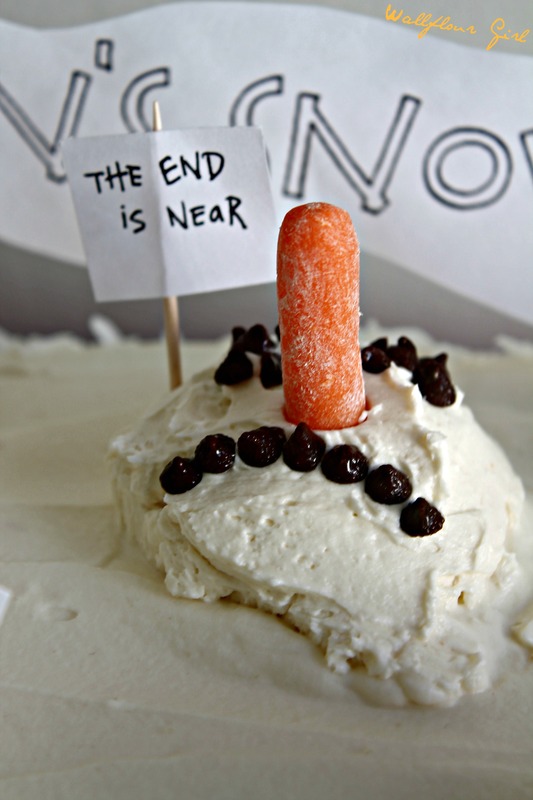 Nobody was expecting a cake masquerading as your average white cake to taste so incredibly moist! his is a Kahlua Rum cake–and not just any rum cake.It is that epic Kahlua cake that you’re bringing to every social function ever. It’s technically another poke cake, since I ended up poking lots of holes with a toothpick around it just to let the Kahlua and rum mixture soak in all the way. It took me a full 20 minutes to make sure every last drop of that amazing glaze made it into the cake, but the Kahlua taste and the crusty exterior/creamy interior combo was so fabulous, the prep was worth every second! One guest asked me what it tasted like and I told her that it’s basically Apple Fritter crunchy exterior meets boozy, which then collides with creamy perfect Yellow Cake. She tried it 😀 and loved it, too. Which cake would you choose? Heat oven to 350 degrees. Lightly grease a 9x13-inch baking pan and set aside. In a medium bowl, combine room-temperature milk, egg whites, and vanilla extract. Set aside. In a separate large bowl, mix together cake flour, sugar, baking powder, and salt. Add butter to dry ingredients and beat in until well combined, about 1-2 minutes. Add all but 1/2 cup of milk mixture to dry ingredients. Beat in until mixture is smooth, then add remaining milk mixture and beat until completely blended. Bake in preheated oven for 25-30 minutes, or until a toothpick inserted in center comes out mostly clean. You'll want to make sure you don't overbake your cake (moisture is key! ), so keep a close eye on it as it bakes and remove it from the oven when your toothpick comes out with moist crumbs--not raw batter--clinging to it. While you are waiting for your cake to finish baking, make your coconut soaking sauce (below). In a medium bowl, combine cream of coconut and sweetened condensed milk. In a medium pot or saucepan, bring milk, flour, and sugar to a boil. Boil for 5 minutes without stirring, then turn off heat and add vanilla. Cool mixture completely, to room temperature. You can place the pot (on a potholder) in the freezer to speed up this process--just make sure it does not overcool. In the meantime, whip butter with an electric mixture until light and fluffy, about 5 minutes. Add cream of coconut and beat for another minute. Add cooled milk mixture and beat for another 5 minutes, until completely smooth. In a separate bowl, whip heavy whipping cream until stiff peaks form. Fold whipped cream into the butter mixture until lightened. Once your cake is prepared, you'll be ready to frost! After your white cake has finished baking but is still warm, poke holes all over the cake with a chopstick or toothpick. (The more holes, the better!) Pour coconut soaking sauce over the cake, using a spatula to coax sauce into the holes and warm cake. Optional: If you still have sauce pooling around the edges after pouring it on the cake, you can invert your cake (carefully, to minimize splatter or breakage) onto a second large platter and poke holes on top. Pour remaining sauce onto the top portion of the cake, and voila! Extra soaked! To make your own cake flour (2 1/4 cups), combine 2 cups of all-purpose flour and 1/4 cup cornstarch in a large bowl. Sift the flour and cornstarch together at least 3 times, until they are very well incorporated--doing so will help achieve the light airiness of cake flour. Preheat oven to 325 degrees F. Lightly grease and generously flour the inside of your 10-cup bundt cake pan. Set aside. Using an electric mixture on medium speed, cream together butter and sugar in a large bowl until light and fluffy. Add flour, cornstarch, baking powder, salt, and 3 tablespoons oil; mix in on low speed until combined, about 1-2 minutes. Add instant pudding mix and mix on low speed for another minute, until combined. Add eggs, milk, rum, Kahlua, remaining 1/2 cup oil, and vanilla. Beat on medium speed until completely combined, about 2-3 minutes. As Brown-Eyed Baker notes, this will be a very thin batter. Pour batter into prepared Bundt pan and bake for 45-55 minutes, until toothpick inserted near center of cake comes out mostly clean, with moist crumbs clinging to the toothpick. As you wait for your cake to finish baking (with about 10 minutes left), make your rum syrup (see instructions below). Once your cake comes out of the oven, wait 5 minutes, then very carefully wiggle your cake out of the pan (I used my spatula and ran it around the edges gently), inverting it onto a large serving platter. Poke lots of holes all over your cake--yes, even on the sides--with a chopstick or toothpick. Using a brush, slowly smear warm rum sauce all over your cake. You'll really want to slow down and smother your cake at this point, making sure the sauce seeps fully into the holes and not down the sides of the cake. This process may take a while: it took me a full 20 minutes to make sure all the rum got in, but this is really the key step to achieving that awesome flavor/texture contrast! Once you're done soaking your cake to the max, slice and serve immediately, and keep any leftovers (what leftovers?) stored in an airtight container at room temperature or in the fridge for up to 5 days. In a medium saucepan, combine butter, water, and sugar. Bring to a boil and boil for 5 minutes, stirring constantly, to create a thinnish syrup. Remove from heat and immediately stir in Kahlua or rum. Great recipes! Hard to resist that combo of cute looks and great flavor. You’re definitely a double winner with these! Thanks. Wow!!! Look at you, fancy award-winning lady! First off, that poke cake sounds AMAZING. You have sold me on poke cakes for life. Second of all, your decorating skills? MADNESS!!! So good!!! I wish I could have been there to witness the amazingness!! 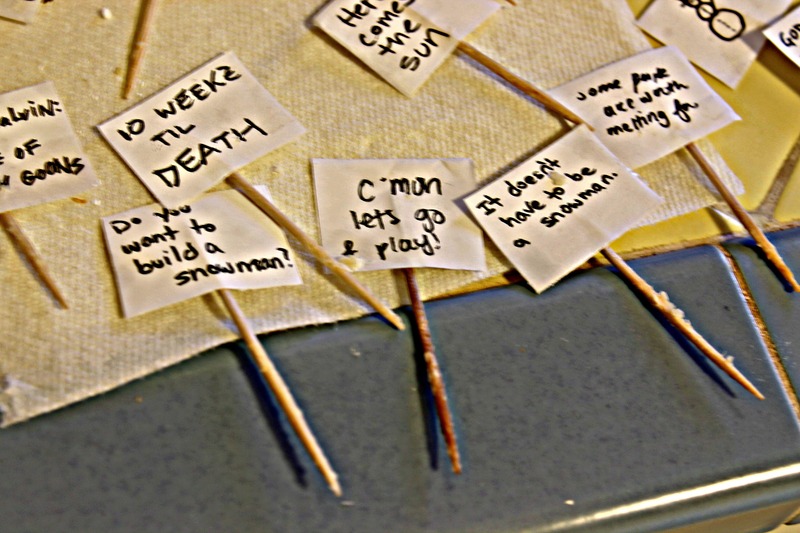 What did you use for the noses on the snowmen? Sliced bits of real carrot! That is what I thought it looked like! Thanks for responding. I’m in charge of the Edible Books Festival at my library. We will be holding our 6th one on Monday/Tuesday. 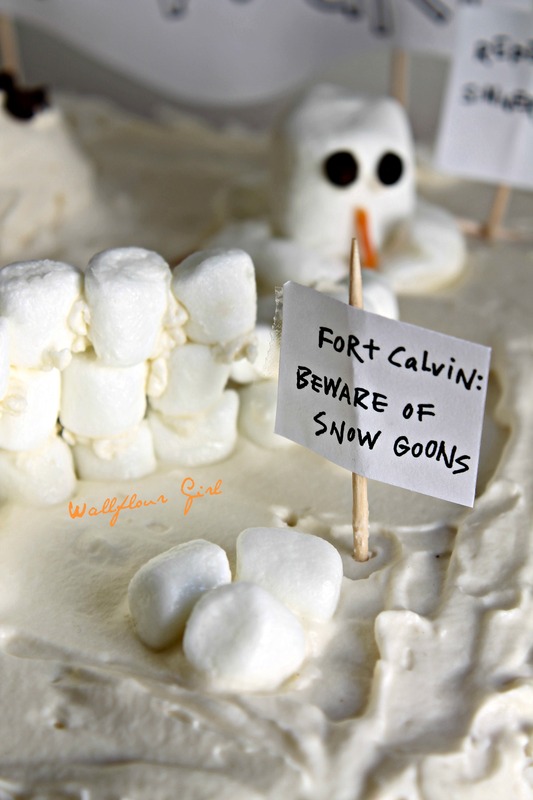 My boss LOVES Calvin and Hobbes, so I was so excited to see your cakes. I’m not that creative, but I’m pretty good at copying/modifying once I see something. 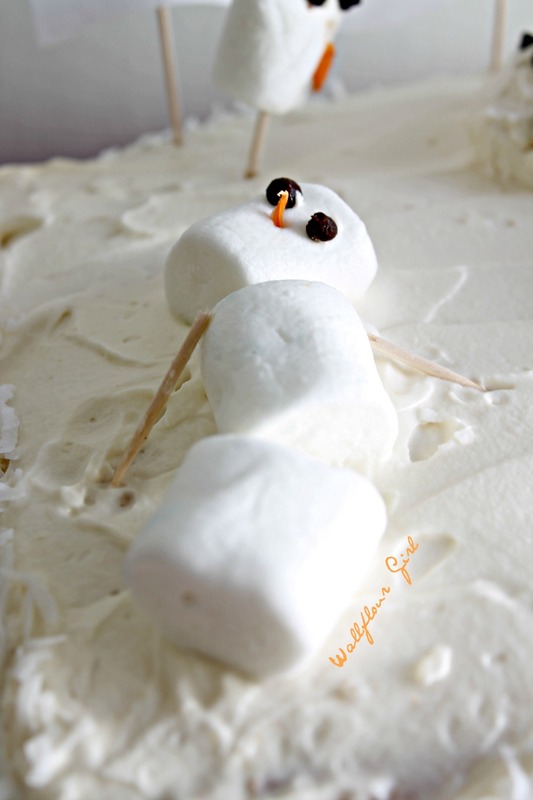 The snow cake is totally within my skill set. I’m very excited to work on it this weekend.